Even though Justice League is not a perfect film, it is still a fun ride and an amazing experience on 4K UHD into a great world that Zack Snyder cultivated throughout the years. In 2013, Director/Writer/Producer Zack Snyder (300, Watchmen) re-envisioned the DC Universe with the release of Man of Steel. A new take on Superman featuring British actor Henry Cavill (Man from U.N.C.L.E., Mission: Impossible - Fallout), Synder continued his "world building" with follow-up films Batman v. Superman, David Ayer's (Sabotage) Suicide Squad, and the Patty Jenkins (Monster)directed Wonder Woman. All those films led to 2017 and the release of the film that would bring Snyder's new world into sharper focus, Justice League. With the death of Superman at the end of Batman v. Superman, the Earth was now vulnerable to more advanced life forms trying to take over the human race. One such person was Darkseid and his henchman Steppenwolf (Ciarán Hinds; The Woman in Black, Tinker Tailor Soldier Spy) who was foreshadowed in the extended director's cut of Batman v. Superman. Seeing his chance to now win an age-old battle with Earth, Steppenwolf arrives on our planet with his Parademons looking for three "mother-boxes", which when put together will end human life on the planet as we know it. The only thing standing in his way is the newly formed Justice League featuring Batman (Ben Affleck; The Accountant, Chasing Amy), Wonder Woman (Gal Gadot; Fast Five, Criminal), Aquaman (Jason Momoa; Game of Thrones, Conan the Barbarian, The Flash (Ezra Miller; Fantastic Beasts and Where to Find Them, The Perks of Being a Wallflower), Cyborg (Ray Fisher; True Detective) and the reincarnated Superman (Cavill). Unfortunately, Zack Snyder's original vision for Justice League never saw the light of day due to a personal tragedy that struck his family during the production of the film that caused him to take a leave of absence. To meet release dates and studio schedules, Warner Bros. brought in Writer/Director Joss Whedon (Buffy The Vampire Slayer; The Avengers) to complete the film. Warner Bros. wanting to use all of Whedon's skillset also let him loose on the script to try to lighten it up a bit as to appease some of the critics of the "Snyder universe" that said it was a bit too dark. This resulted in quite a bit of reshoots and resulted in a film that could be chopped up into two short films. At times, you feel like you are watching the next film in a series, while at other times, the darkness and hyper-stylized action have been replaced by Whedon's quick-witted dialog and lighter (shall we say less brooding) fare. And yes, this also did cause the much talked about CGI-removed Cavill mustache controversy. What truly saves Justice League from becoming a disaster of a film is the amazing cast that Synder, DC, and Warner Bros. have cultivated throughout the universe. Cavill (while relegated to just a small role) is still my favorite Superman to date. Aside from the great action presence, he brings to the character we get to see a softer side of him during a touching mobile phone camera sequence that starts the film. Affleck brings his great stoic hardened, older Bruce Wayne character to screen. As for Godot, there is not much to say other than she has basically the perfect embodiment of the Amazonian princess. Momoa is mostly relegated to a comedic, tough guy role, but we will truly get to see his portal of this character later on this year in his own standalone film. Ezra is truly the vision of Whedon's mind and his dialog just screams like it was said directly from Joss's mouth. While his levity brought tons of laughs throughout the film, it was his more dramatic scenes in the jail with his father that truly show his true essence of Barry Allen. Finally, Fisher's portrayal of Cyborg, while relegated to a minor role in the film, leaves you wanting to find out more about his past and see who he was before his body was replaced by mostly metal. Justice League is presented in 2160p with a 1.85:1 aspect ratio. Even though it is sourced from a 2k master, the HDR10 and Dolby Vision upgrade provides an amazing color depth and range which works well with the "hyper-stylized" look of the film. Colors are bright and vivid and pop even more than they did during its theatrical run. The audio presented in Dolby Atmos is a delight to listen to. The dialog is crisp and clear while the surround sound is "demo-quality" amazing. It truly feels like you are flying into battle with the Justice League as they fight Steppenwolf's Parademons. The battle quite literally surrounds you on all sides with such clarity that would be hard to be beaten by most other 4K films. 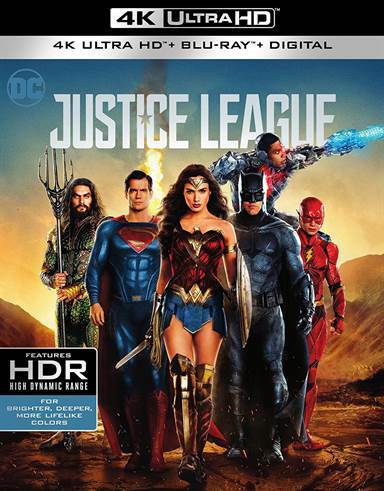 A nice mixture of special features is laid out on the Blu-ray portion of the disc including a much anticipated deleted scene entitled "The Return of Superman", A look into the history of the characters that are part of the Justice League, on-set featurettes, and interviews with the cast. Of course, there is also the now standard Movie Anywhere Digital HD copy of the film that will port over to your favorite platform. It is unfortunate we will never be able to watch the original vision of Justice League that Zack Snyder had created, as it would have been the culmination of everything he had worked on building until now, and while this hybrid Snyder/Whedon version has a lot of stylish and continuity issues because of it's two different directors, it is still a fun film to watch. One can hope that the next film in the universe, Aquaman, will continue with Zack Snyder's original tone and set-up the next few films, Flashpoint, Justice League Part 2, and Green Lantern. Until then, one can be content with Justice League, as it is a solid film with a great 4k UHD Dolby Vision transfer that will look perfect on your bookshelf next to the other films in this ever-expanding DC Universe. Download Justice League from the iTunes Store in Digial HD. For more information about Justice League visit the FlickDirect Movie Database.